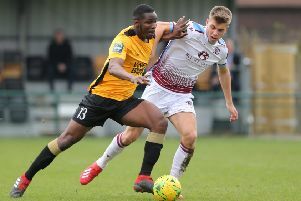 Can Hastings United recreate the FA Cup magic of six years ago? Chris Agutter’s side will travel to Hitchin Town in third round qualifying tomorrow (Saturday). Agutter hopes Sam Beale and Antonio Walker will recover from the injuries which forced them in the Buildbase FA Trophy win away to Waltham Abbey last weekend. Sonny Dullaway was carried off in the same game and his knee became quite swollen.